RCI, the worldwide leader in vacation exchange and part of the Wyndham Worldwide family of brands (NYSE:WYN), recently welcomed 11 new hotels in China to its vacation exchange network through an affiliation agreement with Frontier Vacation Club, part of Days Hotel China. The RCI portfolio of affiliated resorts in China now includes nearly 70 properties. The majority of the 11 Days hotels are located in popular tourist cities such as Emeishan, home to one of China’s four famous Buddhist mountain shrines; Shanghai, the location of the newest Disneyland slated to open later this year; Suzhou, which boasts some of China’s most beautiful classical gardens; and Qingdao, home to the world famous Tsingtao Beer. Days Inn Frontier Shaoguan is located in the heart of Shaoguan, a few minutes’ walk from Zhongshan Park. Situated next to Zhen River, guests at the hotel can enjoy a scenic city skyline with a beautiful view of the pagoda by the riverside. The hotel has 104 guest rooms and provides free Wi-Fi and self-parking for all guests. Built in 2014, Days Hotel Frontier Yantai is located by the sea, just 1.6 km from Golden Beach. This family-friendly hotel has 153 guestrooms with full amenities such as flat-screen TV with cable channels, free Wi-Fi, bath tub, bathroom slippers and free toiletries. Certain rooms have an outdoor seating area with views of the sea, where you can enjoy beautiful sunrises and sunsets from the comfort of your room. Days Inn Frontier Wuxi offers easy access to the city’s popular attractions with its convenient location. The 145-guestroom hotel is a 15-minute drive from Sunan Shuofang International Airport and within close proximity of Tai Hu and Three Kingdoms City. Guests are offered free Wi-Fi in all rooms. Days Hotel Frontier Yangshuo is located by the picturesque Li River in Yangshuo, a county known for its dramatic karst mountain landscape. Bicycle hire is available at the hotel, as the area is popular for cycling. The well-known Impression Liu Sanjie is located about one kilometer from the property. Located near the coast of eastern China, Days Inn Frontier Cixi welcomes guests with traditionally decorated guestrooms infused with modern comfort. Free Wi-Fi, complimentary newspaper and free self-parking are provided. Guests can drive two hours north to spend a day in Shanghai or visit Dapeng Mountain, which is less than an hour away. Days Hotel Frontier Nantong is conveniently located near several attractions, such as Nantong City God Temple, Nantong Museum and Xintiandi Waterbom Park. Guests can enjoy complimentary Wi-Fi, newspaper and self-parking during their stay. Supermarket, shopping malls and an amusement park are also available near the hotel. Recently renovated in 2015, Days Inn Frontier Emeishan is about a 15-minute walk from Emeishan Museum and a 30-minute drive from Emeishan Zhuyeqing Ecological Tea Garden and Feilai Temple, making it an ideal accommodation choice for travelers exploring the area. The hotel offers free Wi-Fi to all in-house guests. Newly built in 2014, Days Hotel Frontier Shanghai Pudong is located in Shanghai’s financial district Lujiazui, a 10-minute drive from Shanghai New International Expo Centre and Jin Qiao International Shopping & Entertainment Centre. It is also an excellent accommodation choice to visit Shanghai Disney Resort, which is scheduled to open in June 2016. 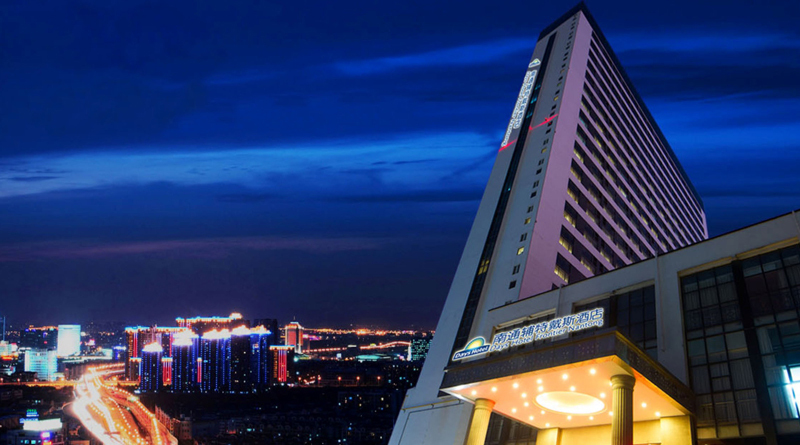 Days Inn Frontier Qingdao Airport is conveniently located for tourists exploring the city, just steps away from the city’s numerous attractions such as Shengwen New Port Qingdao Commercial Plaza and Liuting Sports Park. The 152-room hotel provides a pleasant stay with modern comforts such as complimentary Wi-Fi, sauna, spa, massage and other amenities. Free airport shuttle is also provided. Located in the Jiading district, Days Hotel Frontier Shanghai Jiading is a 30-minute drive from Shanghai Hongqiao International Airport. The hotel provides complimentary Wi-Fi, cable TV, toiletries, hair dryer, free parking and other amenities. Shanghai’s People Square is about a 45-minute drive from the property. Days Hotel Frontier Suzhou Xiangcheng is a brand new hotel in the heart of Xiangcheng district that started operations in early 2016. Its central location makes it an ideal spot to discover Suzhou’s popular attractions such as Xi Lu Garden, Ferris Wheel Paradise and Suzhou Culture & Arts Centre. The hotel provides a variety of recreational facilities, including a fitness center, massage parlor and a theme park for kids. RCI is the worldwide leader in holiday exchange with approximately 4,300 affiliated resorts in more than 100 countries. RCI pioneered the concept of holiday exchange in 1974, offering members increased flexibility and versatility with their holiday ownership experience. Today, through the RCI Weeks® program, the week-for-week exchange system, and the RCI Points® program, the industry’s first global points-based exchange system, RCI provides flexible holiday options to its 3.8 million RCI subscribing members each year. RCI’s luxury exchange program, The Registry Collection® program, is the world’s largest program of its kind with approximately 200 affiliated properties either accessible for exchange or under development on six continents. RCI is part of Wyndham Destination Network and the Wyndham Worldwide family of brands (NYSE: WYN). For additional information, visit our media center. RCI can also be found on Facebook, YouTube and Twitter. Established in 2004, Days Inn China is the first and one of the fastest growing mid-tier hotel chains in China, with hotel franchise and management agreements in more than 23 provinces and 80 cities. Days Hotels are mainly situated in developed tier 1, 2 and 3 cities in easily accessible locations. True to its reputation as “The Best Value Under the Sun”, Days Hotel China strives to offer great value to both business and leisure travelers, including comfortable rooms, free breakfast and free high-speed internet access for an exceptional stay.